Compare Car Insurance and Save upto 60%! By clicking on Get Quotes, you agreed to our Privacy & Security and Terms & Conditions. Over 20+ Top Insurance Companies + Quotes in less than a minute = Satisfaction guaranteed! Shopping smart means saving smart! Smart shoppers know that saving money on car insurance involves 3 Cs - Comparing, Compiling and Cherry-picking. When purchasing Auto Insurance from PolicyBachat.com you are in for something you may not have expected; peace of mind. Our comprehensive coverage is driven by our dedication to great customer service. The answer is simple. At PolicyBachat.com, it's all about you and your needs. It's an always-there, 24/7, count-on-us anytime, anywhere kind of relationship to compare and save on the best car insurance quotes from the comfort of your home. When you have the option of comparing car insurance with us, you can rest assured that everything you need for coverage is here. We'll work with you to make sure your plan fits your needs. We're all about Earning & Saving. Buying an insurance policy through an agent has its limitations. It does not give you the option to compare different aspects of a policy, hence causing you to miss out on some great perks. PolicyBachat helps you SAVE BIG! Talk to an Insurance Advisor today, get the ball rolling! Our insurance advisors make a difference and we stand by that. We do things a tad different from the rest of them. We figure that in a world where you can customize everything from your phones to your car, we understand that individualization is key. You want coverage options, discounts and offers that make sense for you and that’s why PolicyBachat’s smart tools and technology help you tailor a car insurance policy that's right for YOU, not someone like you. By submitting this form you authorize PolicyBachat or it's affiliates to contact you and override NDNC registry. "I would recommend comparing at least four car insurance quotes to ensure you are getting the right price. The fact that most people don’t have the energy or time to visit multiple sites and answer the same long list of questions over and over again is the reason why PolicyBachat.com’s easy-to-fill out form gives you the chance to view multiple quotes for side-by-side comparison." "really helpful and multiple choice for customer to choose right policy. " "good service. adnan was a great help"
"great service spport 👌👌👌spl thanks mr syed 👏👏👏"
"awesome service. very cooperative customer care care executive. thanks "
"it's a nice experience and a very prompt action." "assistant from back office was very good. excellent service. very happy. got rid off from visiting agents. will prefer and recommend to buy online in future from them only. " Get personalized quotes from multiple Insurance companies. Compare coverages, prices, and features to help you make a wise and well-informed decision in less than a minute. Comparing car insurance rates from top insurance companies on your own can be painstaking and time-consuming. Why not let PolicyBachat do the work for you? With an apples to apples comparison, we remove the complexity of researching, comparing and selecting an apt insurance policy with a user-friendly display of premium rates, coverage options, discounts and offers from each of our 30 plus affiliated Insurance companies – all presented in an arrayed form. Some of the more well known automotive insurance companies in India have left their indelible mark on the industry with their sheer presence, growth as well as pioneering services, range of products, and overall financial achievements. Many of these companies have also attained top positions in the industry thanks to their efforts at workforce development and contribution to the Indian insurance industry in general. Here are a list of the top 3 automotive insurance companies in India. 1. ICICI Lombard General Insurance Co. Ltd.
Offers: Cashless claim settlement over 3000+ authorized network of garages across India. Age and profession based discounts on various policy. Zero documentation with instant policy issuance. Quick quote and instant online policy. Offers: Cashless claim settlement at over 4000 preferred garages. Transfer up to 50% of your existing No Claim Bonus (NCB) from any car insurance provider. Towing Facility in case of a breakdown. Zero Depreciation Coverage is available. With many more that can be listed, it makes it difficult to pick the most suitable automotive insurance companies to deal with. To simplify the process of selecting, it's important to understand what coverages and amenities you're looking for in a car insurance company. Are you solely looking for cheap auto insurance? How might choosing the cheapest option affect your actual coverage? What about customer service—that's important, too, right? Know your priorities before you begin looking to buy car insurance. Ideally, you'll want a company that offers great coverage at an affordable price from customer service-oriented agents. Also do not just focus on one or two automotive insurance companies; always get and compare at least three quotes. Talk with family members and friends about their car insurance providers. How long have they been with the company? Are they satisfied with their rates? What about customer service? How has the provider handled their premiums in the events of traffic violations, at-fault accidents, and other common premium-increasing situations? Look for auto insurance companies that offer discounts and good-driver rewards programs. Since the year of its launch in 2005 the Maruti Swift has been popular in the Indian market because of its look. There have been some minor changes in the inside as well as outside design of the car which has retained it the title of being the hottest hatchback car in India. With every new update the car has always managed to get some new elements giving it a fresh look. The new Maruti Suzuki Swift embodies an array of exterior upgrades along with superior mechanics to envy other cars like Hyundai Grand i10, Nissan Micra and Renault Pulse. Considering the maintenance cost and overall pricing of this hatchback, the entry level damage insurance along with liable coverage will serve you in a better way. Calculating the car insurance premium for your Maruti Swift has never been easier with the Maruti Swift Insurance Premium Calculator. Factors that determine the amount of car insurance premium are many. Given below are these factors taken into consideration while determining your car insurance. The auto insurance calculator given above works on these principles while determining insurance premium of your car. Registration City: City where a vehicle is registered is another factor determining auto insurance premium. Cars registered in one of the 8 metropolitan cities viz., Delhi, Mumbai, Kolkata, Chennai, Hyderabad, Pune, Bangalore and Ahmedabad are required to pay higher premium. This is because incidence of vehicle thefts and accidents are higher in these cities. Car Model: With increase in age of the car, insurance premium also comes down. No claim bonus: Insurance companies offer huge discounts on car insurance premium of cars with history of no claims. Car Manufacturer: Vehicles of manufacturers prone to accidents and thefts have a higher premium than cars made by companies with low theft and accident rates. Insurance of any motor vehicle is not optional, but a mandatory legal obligation of any automobile owner in India. It is compulsory to get third party insurance as per the Indian Motor Act. But, while opting for an insurance policy, users should choose the one most comprehensive one. 5. HDFC ERGO General Insurance Co. This vehicle Insurance company boasts of the highest claim settlement ratio. It’s an ISO 9000-2008 certified insurance Co. It has been rated the best in 2013 by IAIR (an international rating agency), and iAAA by ICRA (an Indian credit and investment rating agency). It offers age and profession based discounts on certain policies. The claims are processed promptly and there’s option for cashless settlement as well. 4. The New India Assurance Co. The New India Assurance Co. is the largest general Insurance Company owned by the Central Government, based on the gross premium collection. It’s an ‘A’ rated company by A.M. Best Company. 3. The Oriental Insurance Co. This is definitely the leading player in India in terms of brand value, since it’s fully owned by the Central govt. It’s been the winner of the most reputed awards over the years, including: Best Public General Insurance award and Best Bank and Financial Institution Award, apart from iAAA rating by ICRA. It has the highest claim settlement ratio, the quickest claim settlement, offers various value added services like paying premiums online, renewing/purchasing policies, free benefits of emergency services at various outlets/offices. 2. ICICI Lombard General Insurance Co. This vehicle Insurance company is the largest Private sector player. It offers some of the best and easiest premium paying options. There is zero depreciation up to two policy covers. You can pay EMIs online, take advantage of having digitally signed policy, request a cashless settlement at 2900 garages, varied forms of road side assistance, etc. It has earned the reputation of being the most Customer Responsive Insurance Companies. Amongst the vast number of vehicle insurance company in India, the national insurance company has its reach over the rural and urban regions of India with grass root level informing other people as well as shares enviable track record of offering products to its customer. According to the company, there are in total 1000+ offices in India with 16,000+ working employees to offer best of deals. A special range of car and motor insurance as two wheelers and four wheelers are available with a separate section of commercial vehicle insurance. Here are the factors you must evaluate before deciding upon a particular insurer. Premium: the lesser premium you pay, the smaller the amount you can claim. Road side assistance rider which offers facilities like fuel refilling, battery jumpstarting, lost key replacement, legal advice, etc. Cashless garage network: One of the worst parts of getting into a car accident is having to find a garage that can fix it efficiently and without delay. Finding the best car insurance rates begins with finding competitive quotes. In a matter of minutes, you can have multiple quotes from top carriers with high ratings. Rarely do people shop for policies in person or over the phone anymore. The Internet has superseded virtually every other method of shopping for car insurance and comparing car insurance policies online. But is shopping for and buying coverage online actually superior to more traditional methods? If speed, convenience, and affordability are among your top priorities in obtaining protection, then comparing car insurance and shopping online will likely yield the best results. Getting expenses over the phone or from an agent is a long, tedious process that will consume a good chunk of time and only yield a single estimate. By car insurance comparison, you invest about five minutes in completing the form, and you get up to five complimentary quotes in return. And you can do so at your convenience, in the comfort of your own home, 24/7. Finally, you will quickly see that the online market is fiercely competitive, which works very much to consumers' advantage. Carriers are pitted against one another and pressured to offer the best protection at the lowest possible price, resulting in readily accessible, affordable policies from which to choose. Online car insurance comparison can not only bring transparency in the overall process but also help the common man decide what to opt for and what not to. When you do a car insurance comparison online you can technically build your own custom requirement and sort out from the humongous list of insurance plans from the different insurers based upon it. Did you know that you can save a huge chunk of money after shopping their car insurance rates? Shopping around will likely net you the biggest savings on your car insurance, and it takes less than 10 minutes to do. Compare quotes in no time even while cooking dinner or during long commercial breaks and save on car insuarance! It doesn’t take a lot of time and yet so many of us almost never do it. A big mistake that most people commit is that they renew their policy without much thought or comparison. While renewing motor insurance, you must go online and compare various policies and see what features you can add. The procedure is so simple and hassle-free with the advent of so many websites. Spending additional half an hour on comparing policies will prove helpful and save you money. Another tip on saving on car insurance is to always go through the features of the policy before you renew it. There might be some you no longer need or something that you might want to add to it. For example, you might be paying extra premium for personal accident cover of 10 lacs. If you already have personal accident insurance, you can remove this clause and pay less for the policy. You are rewarded with a No claims bonus if you haven’t made any claims in the preceding year. If you are eligible for No claim bonus, don’t forget to claim it. This amount will be deducted from your overall quote and you’ll have to pay lesser premium. Over the years, No Claim Bonus can decrease the premium amount by up to around 50 percent. Another great tip on saving on car insurance! It is important to renew your car insurance as it monetarily keeps you away from liabilities and unexpected circumstances. Accidents are common and unpredictable. If you do have an accident after your plan has expired, you’d have to shell out a lot of money and incur huge financial loses. The longer you wait to get your expired car insurance renewed, the tougher it will be to find an insurer willing to renew your policy. Besides that, you’ll also have to bear the charges of having your car surveyed. Are you familiar with the fact that a policy lapsed for more than 3 months could make you lose on your accrued NCB? Think about this, the no claim bonus raked up over four years could stack up to 45-50%. Be prepared to pay heavy fines. Earlier, the Motor Vehicles Act, 1988 governed the road safety and traffic rules. Recently, the Government passed the Road Transport and Safety Bill 2014 to replace the Motor Vehicles Act, 1988. Among other changes, the Bill penalizes you heavily if you are caught driving without having a valid insurance cover. Losses for damages caused to third party or property. In an accident, if you unintentionally harm any person or surrounding property, you are liable to pay the loss incurred. This is called third party liability. Your car insurance mandatorily covers this third party liability and spares you the loss incurred. In the absence of a valid insurance cover, you would have to bear the losses incurred. If the person dies, your liability would be very high. Besides the financial loss suffered in an accident which causes damage to a third party and/or self, you would also be entangled in legal complications if your car is found without a valid insurance cover or an expired car insurance policy. You would be penalized, get a challan and might even be imprisoned. This type of policy only covers the third person who has been injured in an accident where the owner is accountable. It covers the insured person's liability to third parties' loss caused by an accident involving the auto vehicle of the insured. This refers to the minimum risks that are to be covered under the Auto Vehicles Act 1938 (Act Liability). It doesn't cover the expenses, damage, theft or injuries of the owner. This type of plan is made compulsory by the law of India. This type of plan has a wider scope and covers all the above mentioned liability along with the insured person's damage, theft, expenses and injuries in result of an accident of the auto vehicle. This type of policy can be extended to increase benefits as an additional feature. It is advisable to opt for a comprehensive motor insurance policy as it covers the repairing costs of the damage caused to your car also. Zero Depreciation Cover: In case you need to replace some parts of your car, the car insurance plan pays you the depreciated value of the part and not the invoice value of the part. In case you have opted for a Depreciation Cover, you would be paid the actual price of the part and not the depreciated value. Insurance companies usually offer this value added cover for cars which are a maximum of 2 to 3 years old. This benefit comes with a small increase in premium. Invoice price cover: In case of a "total loss" of your brand new car due to severe damage, the insurance companies will pay you the depreciated value of your car and not the price to purchase a new car. If you opt for this add-on cover, you effectively receive an amount to purchase a brand new car. Companies also pay the road tax and registration costs with this cover. It is also called the "Return to Invoice" cover. 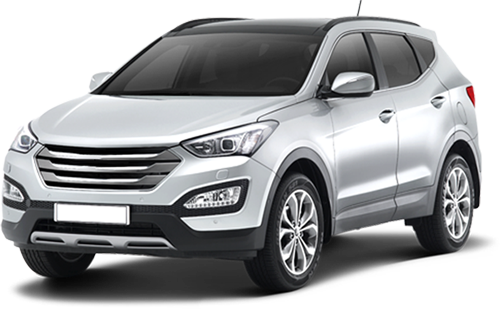 This too is available only for cars which are 2 to 3 years old and can be availed by paying extra premiums. Emergency Assistance: There are a variety of assistance which insurance companies offer as add-on covers for nw car owners. These include Emergency Transport, Daily Allowances, assistance if you run of out fuel, towing facilities, taxi benefits to name a few. Some are offered as freebies and some are charged as part of the annual premium itself. Small measures which can actually be very handy when you are stranded. Looking for the best rates on car insurance? You've come to the right place. 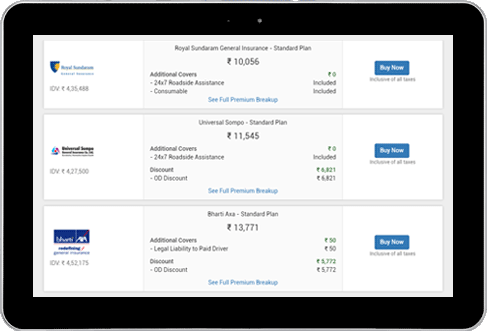 At PolicyBachat.com, we’ll help you compare the most competitive offers from India’s leading auto insurance companies. We will provide you with Instant Car Insurance Quotes that suits you best while saving time and money. Just fill out our insurance form and click 'Compare' to find your quotes. Auto insurance rates for the same driver with the same car can vary wldely between insurance companies, which is why comparing rates and getting instant quotes is the only way to get the best deal. We only ask for the details we need to find you the best quotes in your area. Your information will never be given to a third party. We cast a wide net. Our quoter brings you 20+ personalized car insurance quotes from all the top insurers. Online quote comparison sites like ours make it simple – just fill out our auto insurance form with your driver details and we'll find and rank the cheapest auto insurance rates available to you. Plot-4, Road No. 45/A, Masthan Nagar, Jubilee Hills, Hyderabad - 500033, Telangana, India. *Insurance is the subject matter of solicitation. Visitors are hereby informed that their information submitted on the website may be shared with insurers. The product information for comparison displayed on this website is of the insurers with whom our company has an agreement.Product information is authentic and solely based on the information received from the Insurer. © 2019 Deztination Insurance Web Aggregators Pvt. Ltd. All rights reserved. PolicyBachat and PolicyBachat Logo are registered trademarks of Deztination Insurance Web Aggregators Pvt. Ltd.
Great to have you back on our site! We note that you had left your transaction unfinished the last time you checked in with PolicyBachat. Would you like to continue with the same quotes or look for a new insurance policy?